LOCATION: ???? TBA ??? Scheduled tournament location cancelled. TCY is searching for new location. Each tournament competitor registration or seminar registration includes a $5 tax-deductible donation to Tai Chi Youth. 1. Shoes required unless working on mats or flooring per decision of establishment management. 2. Push opponent from waist to shoulders. Punching, poking, grabbing, seizing, and joint locks not allowed. 3. Lift a foot completely off ground = opponent point. Touching ground with hands = opponent point. 4. 30-seconds competing with left foot forward plus 30-seconds with right foot forward = complete match. 6. Judge decisions are final. Judges can disqualify any opponent for improper conduct = opponent victory. 7. Excessive force = 1 warning. Subsequent excessive force = points for opponent. 8. Opponents grouped as underbelts or black belts. Divisions per each 25 pounds per day of match weight. 12. Events are filmed so artwork permissions are required. 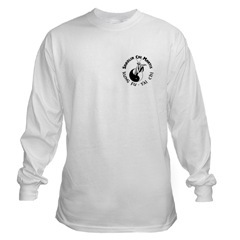 Tai Chi Youth, Buddha Kung Fu, and Shaolin Chi Mantis clothing and logos are permitted in tournaments, seminars, and videos. 13. Participation in this tournament is consent to use your name and likeness without any compensation or reward in all media formats. Please inform us during registration of proper spelling of your chosen name. 14. No long finger nails, warts, open wounds or bandages on hands, wrists or arms. 15. Falling down is possible. Please don't get hurt or hurt your opponent. 16. No touching of legs, knees, neck, head or feet. If foot slides without lifting, judges will stop and restart. 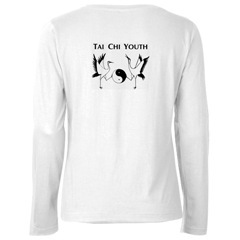 Tai Chi Youth, Buddha Kung Fu, and Shaolin Chi Mantis clothing = permitted in tournaments and videos. Participants consent to being included in Tai Chi Youth promotions, advertising, short films and documentary footage. Be respectful to judges and exhibit your best behavior at all times during the tournament. Spectator seating may or may not be provided per event location management. Tai Chi Youth is a nonprofit organization supported by foundations, donations and government grants. Sponsor our good reputation. No refunds except for cancellation or rescheduling of tournament. 1. 60-second time limit starts at beginning of Tai Chi Form performance. Timekeeper will announce, "Time." 2. Judges will strive to score per your Tai Chi style, so announce your form and include your Tai Chi Style. 3. No deduction in points or scoring for reaching the 1-minute time limit. Just end gracefully in current movement when Timekeeper announces, "Time." 1. 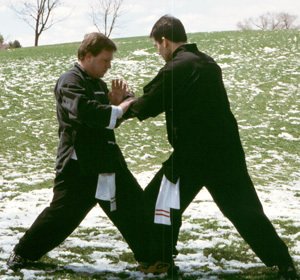 One of three chosen movements of Tai Chi Form demonstrated by 5 to 10-second Tai Form performance. 2. Slow-motion application WITH PARTNER with verbal explanation of effectiveness. 3. Fast-motion application WITH PARTNER displaying effectiveness without injuring partner. 4. At completion of three demonstrations, stand in front of judges with partner to your right side until judges announce scores. 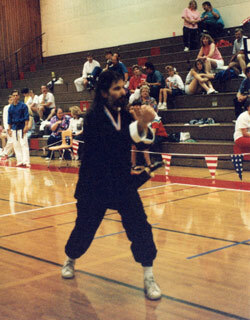 Tai Chi Youth, or any of the other enterprises of Richard Del Connor, is not responsible for any injuries suffered while attending our classes, seminars, or tournaments. 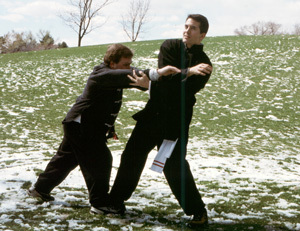 You, the spectator, student, or competitor is fully aware of the physical rigors and possible risk of injury inherent in participating in martial arts training and competition. He/she realizes that not all techniques may be successful in every situation and proficiency can only be achieved through a combination of continued practice, exercise of good judgment, and natural abilities. He/she freely assumes all risks of any type of injury. Sign up for the TCY Newsletter. Class start dates, events, seminars, tournaments, graduations and good news from Tai Chi Youth. Tai Chi Youth is a 501(c)(3) nonprofit charity organization. © Copyright 2016 shaolinMUSIC.com All rights reserved.